I couldn't do it. I just couldn't finish it. This could be so interesting--an in-depth look at the economics and social impacts of economics from 850-1550 or some such. But no. Thank you, Dyer, for botching the job. I couldn't figure out who his audience was--one minute he would be describing the minutiae of wool gathering and sales, the next painstakingly explaining what the Norman Conquest of 1066 was. Was this supposed to be a popular book? A book for historians that are looking into economics? For economists looking into history? No idea. And while his lack of footnotes or endnotes or anything other than a "suggested further reading" section makes this seem like a popularly-aimed book, it makes me nervous about his assumptions. How are you basing your theories, Dyer? Especially your assertion that the Conquest didn't really affect the English economy? Also, he won't stick to an idea. I was positively burdened with his negative language regarding lords and the aristocratic class (did some lord step on his great great grandfather or something?) and then he briefly mentions that the lords were in a bind themselves. Apparently everyone had it rough, but he does not balance his explanations of how and it's just a confusing mess. Definitely not recommended for those looking into an economic breakdown of the middle ages. A broad overview of economics in this period.Covers all sorts of topics. Coinage, trade, taxes, rents, farming practices, towns and their growth and other aspects, the effects of the Great Famine and the Black Death. Changes in practices, such as the freeing of slaves, and the forcing of peasants into villages. The lords' attempts to get money, not always successful. The changes after the Conquest.High level and academic, with individual cases being treated as examples. Chock-full of stuff. Dyer's economic history of Medieval Britain offers a high-level account of the transformation of systems of production and exchange during the Middle Ages. Drawing upon illustrative demographic statistics as well as individual biographies, the text highlights the technological and administrative innovations that helped drive the growth of urbanization and the market economy, while underscoring the continuity of the basic institutions of feudalism. Dyer rejects narratives dependent upon any one causal force behind economic evolution, and emphasizes the role of responses to contingency and crises at all levels of society. A solid and entertaining book (if you're a serious history or economics buff). Part of The New Economic History of Britain series. Upper level college class level, not the first book to read on the Middle Ages, but can be read after two or three others. No footnotes, but an extensive 'Further Reading' section.The book is divided into three parts - Anglo-Saxon, Norman to Plague, Post-Plague. Dyer discusses all the different economic classes, lords, peasants and the emerging merchant class (NOT the middle class). I enjoyed the plethora of specific examples in the book. This was a fine if not scintillating review of work in the middle ages. Now, there are of course limitations in terms of the evidence--there are not many sources from the point of view of the lower classes or many that cover there lives. But Dyer is as thorough as one could be under the circumstances. There are many strands one could comment on - one thing that struck me is the extent to which well-written history can remind us that a human life is ever so brief, and judgments made too closely and singularly from the basis of one's lived experience risk being profoundly wrong.If halves were available I'd give this 3 and a half stars. I really enjoyed this book and was surprised I did due to the rather stuffy title. Much of the information is unique and hard to find in other areas. The overall layout and readability also make much of the history in it accessible. Packed with information but deadly dull. It reads like a financial report. I couldn't force myself to finish it. That said, if you're preparing a paper or writing a novel set in Britain between the years of 850 and 1520, this would make great source material. Very academic. It is not for light/casual reading. Then again, most economics books are not light reading. Still, it is hard getting past the cold academic writing. Very informative, but also quite dry. Christopher Dyer - Christopher Charles Dyer CBE FBA (born 1944) is Leverhulme Emeritus Professor of Regional and Local History and director of the Centre for English Local History at the University of Leicester. He was appointed Commander of the Order of the British Empire (CBE) in the 2008 Birthday Honours.Dyer is well known as the historian of everyday life, a recurring theme in his publications. Dyer looks at the economic and social history of medieval life, with an emphasis on the English Midlands from the Saxon period through to the 16th century. He was invited to deliver the Ford Lectures in the University of Oxford in a lecture series entitled 'An Age of Transition? 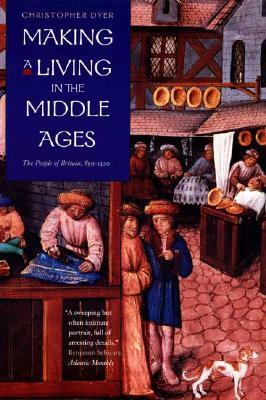 Economy and Society in England in the Later Middle Ages'.